Since they're already using the dark olfactory arts to lure you in, Cinnabon figured they might as well hook you up with some free coffee. 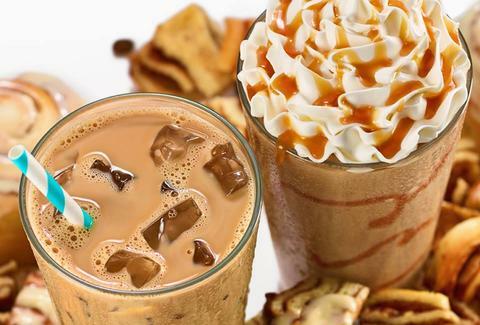 This Saturday, June 7, the chain will be handing out 16oz cups of its new Cinnamon Roll Iced Coffee from 1-5pm -- and that time slot actually has some meaning behind it. On top of getting people to try the coffee, Cinnabon is hoping to raise awareness for Share Our Strength's No Kid Hungry mission, which aims to end the childhood hunger affecting 1 in 5 kids in America. Seeing as you support feeding hungry kids, free drinks, and the fashion sensibilities of Hot Topic, there's now no excuse to avoid the mall this weekend. Kristin Hunt is a food/drink staff writer for Thrillist, and would be totally cool with her apartment smelling like a Cinnabon. Follow her at @kristin_hunt.